Four students at a Washington elementary school ingested cocaine brought to the school by a classmate Wednesday, school officials said. Some of the kids who ingested the cocaine did so orally and others inhaled it through their noses, according to Fred Lewis, a spokesman for DC Schools. He said they were hospitalized as a precaution as was a fifth student who did not ingest the drug. The children were being examined at the Children's National Medical Center, according to spokeswoman Paula Dart, and all were in good condition. She could not comment on whether they would be kept overnight or when they'd be released. The pupil who brought the drug to share has been charged with possession of a controlled substance, Lewis said. The names and ages of the students have not yet been released, but the school runs from preschool to fifth grade. It is located in the Northwest area of the capital. Parents were told what happened by voicemail and a letter that was sent home with all students, according to spokeswoman Safiya Simmons. Parents were staggered to learn the news when they picked their kids up at school. "This is just really shocking to me, I have no words right now," said Myisha Wallace, who has a son in 4th grade. "I'm not going to really lay blame on the school because I love this school, my son has been going to this school for several years, my daughter is a former student at this school, so I'm not going to say that the school is responsible." Nicole Jackson, whose child is in first grade, said her son told her, 'Mommy there was naughty medicine in the school. One of the kids had naughty medicine." She called the incident "very scary." Stuart Hovell said he was "disgusted" and was going to take his daughter out of the school. "They told me as soon as I showed up to pick her up, the kids did -- that some kids was dealing drugs. ... I don't know -- it's sad." 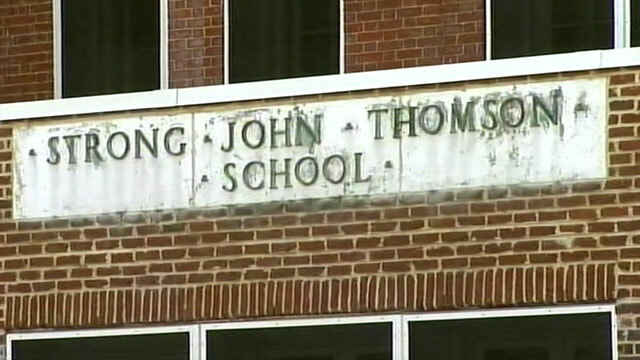 "This is not a situation that is typical at Thomson, and we take it very seriously, " Principal Albert Dupont wrote in the letter. He said one of the students involved alerted a teacher to the incident, and police were called and confirmed the substance was cocaine. Parents will receive another voicemail update tonight. There is no school this Friday because of previously scheduled teacher meetings, but counselors will come to Thomson on Monday "to educate students about the dangers of drugs," Lewis said. Police are investigating but would not comment. The school was recommended to President Obama for his daughters in 2008 in an article in the Washington Post, which called it an "educational gem." +Should Fraternities Be Shut Down?